The manual's description about Pixhawk 4's I/O PWM Out to Power Management Board's I/O PWM In and FMU-PMW-in is confusing. Do I need a Y wire to connect pixhawk4's I/O PWM Out to both PMB's I/O PWM In and FMU-PWM-In? And use PMB's FMU-PWM-out 1-4 for servo, and PMB's M5 and M6 for motor? If I misunderstand the table, please state out too. 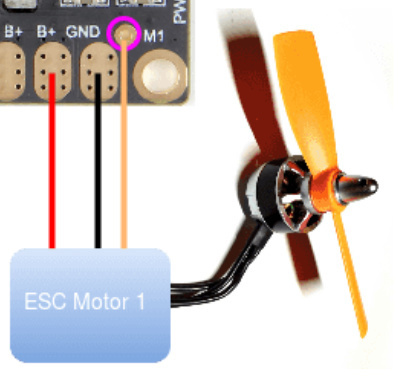 If you don't know what I am talking about, you may just simply show me how you connect the Pixhawk and PMB for an standard plane like aircraft which has both motors and servos in MAIN channels. That would help me. Great Question. I do not have an answer for you but have you tried soldering any ESCs with motors to the PMB's M(1-8) = signal, GND = ground, B+ = power? On a separate note, I was wondering how to remap FMU-PWM-out 1-8 and asked here http://discuss.px4.io/t/pixhawk-4-fmu-pwm-out-channel-malfunction-px4-version-1-8-2-standard-airplane/9402 Have you had any luck with this? I did not figure out how to remap on PX4. However, I started using ardupilot instead and I had more success at getting all 8 FMU_PWM_OUT channels working.